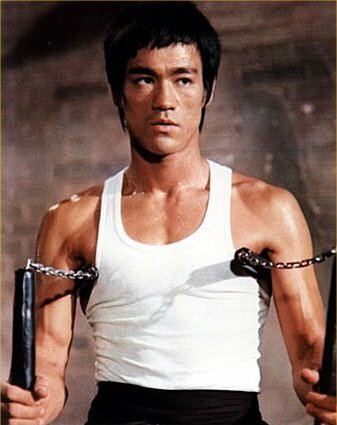 "..ngefans sama bruce lee atau mau kayak donnie yen di film ip man?? atau pengen belajar beladiri praktis yang taktis dan kerenn untuk menjaga diri anda dari tindak kriminalitas di jalan??? "Pengen Latihan wing chun tapi sulit menemukan tempat latihannya?? sekalipun ada namun biayanya cukup mahal dan tidak cocok dengan kantong anda"
Jangan khawatir ane disini akan ngasih sebuah solusi yang cukup cerdas untuk ngejawab semua pertanyaan di atas tentunya dengan investasi yang amat sanngaaat sangat murah.. Basic - Advance + Aplikasi pada perkelahian yang sesungguhnya baik tangan kosong maupun menghadapi senjata tajam.. This video deals with the basic, but absolutely essential aspects: hand and foot work, stepping, basic punching, kicking and the principles of the centreline. Wing Chun has a speed and directness of action that is difficult to match. Master Wong's Wing Chun will teach you to effectively utilize the unique and powerful qualities of this system. This video will move you on to basic hand techniques between two people, blocking of punches and kicks, how to grab as well as body positioning and the first fundamental combinations of Master Wong's Sil Lim Tao System. In this part Master Wong will move you on to how to control your opponent with the basic uses of stepping and trapping, as well as the full Sil Lim Tao form with complete overview on application from Master Wong. The last part of Sil Lim Tao, this instalment deals with each component of the Sil Lim Tao form by breaking it down in detail, with complete explanation of how each specific principle of movement and technique is applied. This first part will introduce you to the invaluable aspects of 'energy drills' including -- Punch Drills, Elbow Drills, Lap Sao and how to change between each, eventually becoming a light spar in which to practice in real time the techniques you have learned. The importance of training like this is developing these tools as second nature, making use of sensitivity in combat. Master Wong's Chum Kiu takes his Wing Chun syllabus to the next level. The essence of 'Sinking Bridge' implements how Wing Chun breaks down, and destroys your opponent's defences. This part will illustrate in detail the finer points of how to punch properly and at close range, the use of pads to enhance the mechanics of your body movement, as well as how to move and control a person at close range in the combat zone using Wing Chun. Master Wong's Chum Kiu takes his Wing Chun syllabus to the next level. The essence of 'Sinking Bridge' implements how Wing Chun breaks down, and destroys your opponent's defences. Lastly, this final part will take you step by step as before through the Chum Kiu form. Master Wong will guide you in detail, with complete explanation on how to apply each element in Chum Kiu. Master Wong's Chum Kiu takes his Wing Chun syllabus to the next level. The essence of 'Sinking Bridge' implements how Wing Chun breaks down, and destroys your opponent's defences. Goes through the entire Biu Jee form and its application; broken down into individual parts with overview. You will be taken in detail through how to utilize Biu Jee effectively and safely. Master Wong illustrates with action how to utilize the specific techniques inherent in Biu Jee - how to break down and finish off your opponent. Continues directly from Part 1 with demonstration and explanation of the Biu Jee form and its application in the close range combat zone. Introduces full energy drill and Chi Sao, with explanation on reasons for its use, and direct demonstration of its capabilities within punch drill, elbow drill and lap sao, focally illustrating how to flow naturally at speed in between drills. Also, further details from Master Wong on extreme close "inch" range. Part 4 places emphasis on striking to vital points with the lower and upper parts of the body, finger strikes, controlling body position and becoming accurate within Biu Jee's most destructive aspects. Part 1 deals with the 'how's' and 'why's' of practicing application on a person in relation to methods used in dummy training. This exclusive area deals with the optimisation of speed, accuracy, conditioning, and the application of power with technique. 116 Dummy is arguably the ultimate in Wing Chun training aids. This takes Wing Chun application to the next stage by applying it in real time with the use of this tool thereby increasing the bodies abilities and allowing the practitioner to move harder and faster. Part 2 introduces how to manoeuvre the body in and around the dummy using Wing Chun body movement, how to step, kick, punch, and block the dummy as if it were a human being. This part guides you through all 116 movements of the full Wing Chun 'Dummy' form, with complete overview of specific techniques when practicing with the dummy to ensure correct training. This first part gathers the most fundamental movements and methods of offence and defence from Sil Lim Tao and Chum Kiu, and puts them into the fighting zone, teaching you the best ways to attack in specific situations as well as defend, along with further use of advanced techniques with deeper explanation of how and why, breaking down its use. This second part deals with offensive and defensive situations within Biu Jee, and 116 Dummy training in Master Wong's Wing Chun System. This teaches you how the ideas and fundamental principles of these two areas of training are applied as they occur in the 'real world'. This first instalment will take you through the use of basic Wing Chun techniques for self-defence, including how to get out of grabs, defend against various assaults such as pushing, hitting and kicking. By drawing on his extensive learning Master Wong has created this hybrid method of training in order to speed up learning. Wing Chun's nature, as an outstanding form of self-defence has been made more available and practical for all. For much of the training you will practice with a partner, learning to apply specific techniques to people rather than dummies or thin air. This second part goes into detail on the defensive techniques against straight punches, kicks, hooks and tackling, as well as how to implement the elbow, the knee and the legs effectively against vulnerable areas, and how to control distance in relation to your opponent. This last part includes further aspects of self defence against mugging assaults such as bear hugs, grabs to the throat etc... Also, complete explanation of how to defend against knives using Wing Chun Self Defence. Total semua adalah 22 cd video seharga 440rb "GILE LO GAN MAHAL AMIRRRR...."
Original Posted By freelx► Lapor Gan, barang sudah diterima sesuai jadwal. thanks Gan. Semoga bisa saling jual beli lagi di lain kesempatan. Ane ada byk barang yang mau di jual nih, kalo pas barang dan harganya sesuai. Ane juga ada koleksi dvd wingchun yang otentik dari ananknya Ip man. Original Posted By Neody► lapor gan..
master wong udah sampe ke rumah ane 5 menit yang lalu..
ane berikan agan stempel "RECOMMENDED SELLER"